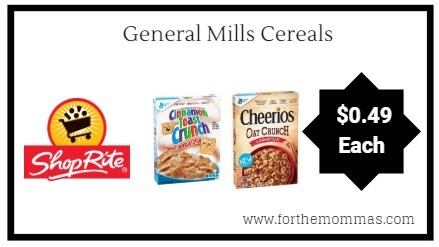 ShopRite: General Mills Cereals As Low As ONLY $0.49 Each Starting 9/16! Thru 9/22, ShopRite will have Cheerios Oat Crunch Cereal and Cinnamon Toast Crunch Cereal priced at only $1.99 each. In addition to this, we have a coupons available to stack with this deal to make your final price ONLY $0.49 each.